Decision: Which Sigmar support characters best fit in a defensive deck? Steelheart's Champions are the clear winners, with Cursebreakers a distant second and Farstriders a very close third. These models are very easy to compare in terms of bottom line stats - uninspired, they are all exactly the same. Even when inspired, the models have very little variance, with only the Cursebreakers breaking from the 3-2-4 mold. 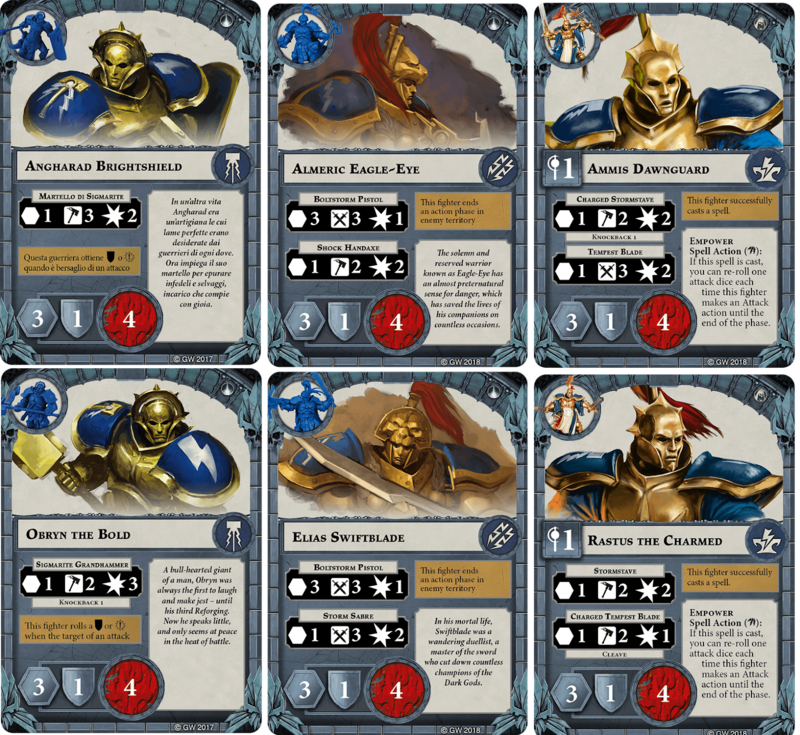 Unfortunately for the Cursebreakers, their 1 die "on-guard" defense can't stack up against the other Sigmarites' double block. Cursebreakers will fail defense on about 8% more rolls than their counterparts. One minor upside to the Cursebreakers' defense - they succeed on defense against Cleave about 3% more of the time when inspired than the other models. Still, in this category, the Cursebreakers remain solidly underneath the other two warbands. To begin, the Farstriders are the only models to have ranged attacks. While a 3 sword, 1 damage attack isn't terribly impressive, having any option to make range 3 attacks gives the Farstriders the upper hand outside of the 1 hex range. Essentially, each of the Farstriders comes pre-upgraded with a 1 glory ranged attack - though not a particularly good one. In order to establish a baseline for melee attacks, it benefits us to examine the relatively simple attack byline of Sigmarite Hammer. A 1/3/2 axe attack - dealing 1.75 damage on an average unblocked use - that has no additional effects serves as a good point of comparison for assessing the other Sigmarite attacks. In the Champions lineup, Oberyn's Sigmarite Grandhammer does slightly more average damage (2.25) per use and has knockback at the cost of being slightly less accurate. When inspired, neither Champion upgrades their basic attack, instead gaining either a Cleave variant or a high accuracy counterattack. These inspired attacks are both quite strong, with Brightshield's counterattack truly standing out due to the combination of its high accuracy and her very consistent defense stat. The Farstriders' uninspired melee attacks are suitably uninspiring in comparison to those of the Champions. Shock Handaxe is strictly worse than either of Hammers, and Storm Sabre is even worse than Shock Handaxe except when fishing for criticals. Upon inspiring, Charged Handaxe picks up a damage, making it comparable to Grandhammer or Overhand Strike, but lacking in supplemental effects. Charged Sabre picks up Cleave, raising its value significantly, but sticks at 2 damage. Nonetheless, of the Farstrider melee attacks, Charged Sabre is arguably the best, with its lack of inherent accuracy compensated by Cleave. Overall, the Farstrider melee attacks are strictly worse than either the Champions' or Cursebreakers' melee options - the real question lies in whether their innate ranged attacks make up for their lack of melee prowess. Both of the Cursebreakers start with 1/2/2 axe Charged Stormstave attacks (Ammis' has knockback - big whoop), which are less than impressive at 1.5 damage per unblocked use. However, each Cursebreaker also has a secondary attack. Unfortunately, Ammis' secondary attack - Tempest Blade - is kind of a turd, as it's strictly worse than his Stormstaff. Rastus picks up a high accuracy Cleave attack, but at only 1 damage, it doesn't exactly impress. Upon inspiration, the Cursebreakers step up their attacks significantly. Rastus's Cleave attack improves to 1/3/2 axe that will almost always hit, though it does less damage than Oberyn's. Ammis picks up a 1/3/3 axe attack with knockback, which packs the second best average damage of any base attack in the game (beaten out only by Grimnir's Blazing Latchkey Axe). In defensive decks, attacks happen rarely and need to be impactful when they do. When viewed in that light, Ammis and Oberyn shine due to their capability to slay a lot of models with a single swing. 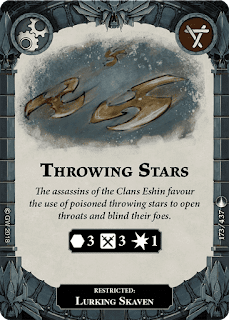 Attacks with Cleave should also be valued highly in defensive decks, and while each of these warbands serves up a Cleave attack, the Farstriders' version is the weakest. Both the Cursebreakers and Champions provide a versatile array of powerful attacks. However, Ammis' counterattack is simply built for defensive decks, and provides the Champions with the edge they need to outpace the Cursebreakers in melee. 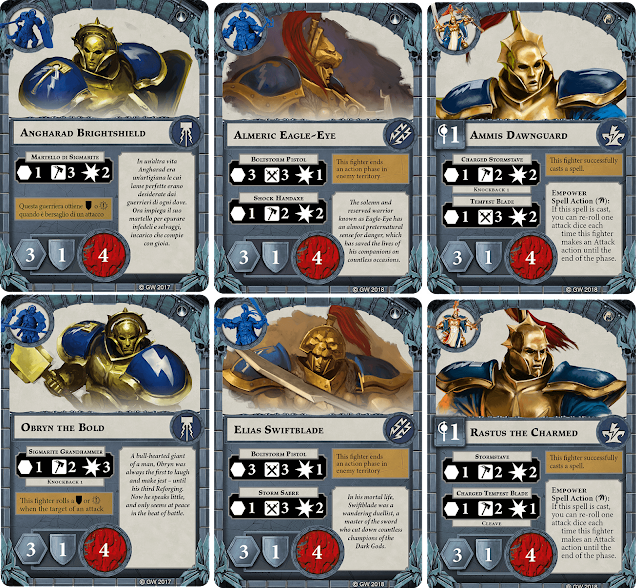 The factors for inspiring these guys have already been examined in our look at Sigmarite leaders, here. Moving from that starting point, the Champions don't really change the game much. They'll probably inspire in most games where they are engaged. The Farstriders' already unfortunate inspire condition becomes even more unfortunate for the support models, as they don't have the Leader's 4 movement. Representing a sort of mirror to the Champions, in a defensive deck, they probably won't ever inspire. Finally, the Cursebreakers are actually quite a bit easier to inspire than their Leader, thanks to an innate spell action that works 67% of the time. Having an inspire condition that is completely independent of the enemy gives them a slight edge over the Champions in this case for purely passive decks. The Farstriders don't have any ancillary abilities, instead gaining a base ranged attack. The Cursebreakers all have the wizard trait, but they are even worse at successfully casting spells than their Leader, who gains only a very marginal increase in utility from being a wizard at this time. Finally, the Cursebreakers both have the Empower action. While it should mostly be used to inspire your fighters, it does provide some marginal utility when no other options present themselves. This situation will occur most often in the 3rd phase, when you are running low on cards to draw and play. In that case, Empower can make a big difference in your ability to kill an enemy or two before the end of the game. An Empowered Linked Weapon attack from Ammis boasts a hearty 94% success rate and does an average of 2.82 damage per unblocked use unmodified. 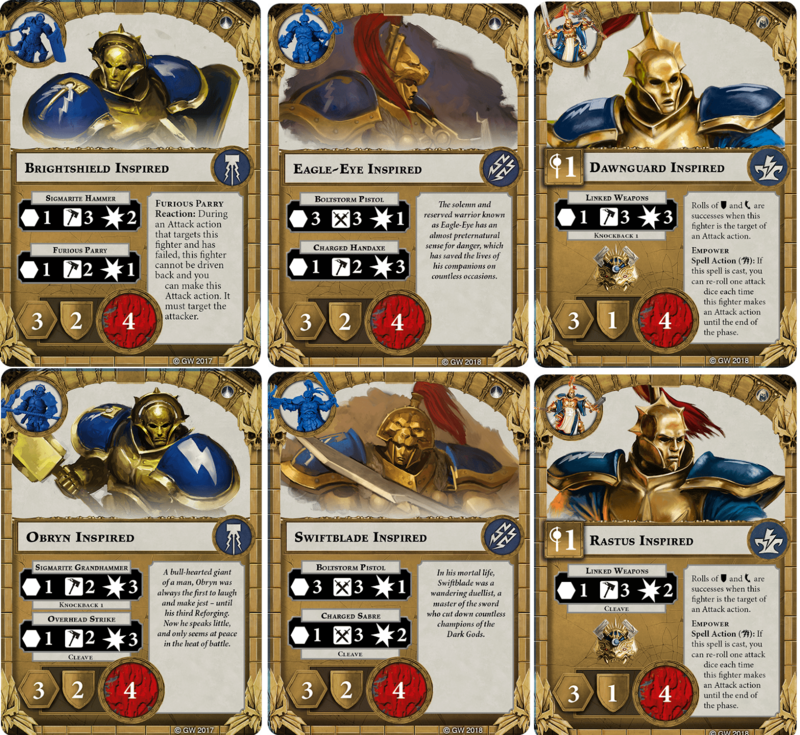 The Sigmarite Leaders article already addressed Ploys and Objectives, and little changes when we consider the support models. There are some small things to consider - like the ease with which the Cursebreaker supports activate Harness the Storm - but these are minor considerations at best. The Champions still smash the scales with 5 glory in objectives and superior upgrades and ploys across the board. However, each of the support models does have access to some upgrades not useable by the leader. For the Champions, Block stands out as a huge action if you tend to keep your models close together. A single action from Brightshield can increase all of your models' defense success rate by 16% uninspired and 14% inspired. Oberyn doesn't pick up anything useful of his own, but he can equip Heroic Might to grab Cleave before he inspires. For the Farstriders, Eagle-eye can also pick up Cleave with Sharp Eyes, which has the additional benefit of giving his Boltstorm Pistol Cleave as well. Swiftblade could pick up a very slightly more accurate Cleave attack or an area attack, but neither fits well with a defensive theme. The Cursebreaker supports could consider either Lightning Whip or Stunning Blow, but each has significant issues. Great Strength is strictly better than Lightning Whip in all but a very few situations, none of which are likely to come up in a defensive deck. Stunning Blow packs a powerful effect, but if you're playing defensive correctly, most of your opponents attacks are going to be at the end of a Charge action anyway. While not specific to the support models, Eye of the Storm goes from nearly unplayable on Stormsire to something to be seriously considered for Ammis and Rastus. First, upgrading either support model with Eye gives them the ability to automatically inspire and use their Empower action to gain additional accuracy. Second, when upgraded with Eye, Rastus and Ammis actually become better at casting certain gambit spells than an un-upgraded Stormsire. If you do decide to play Eye of the Storm, Infinite Riches should also be considered, as it increases to a 67% success chance when cast with Eye. Additionally, Abasoth's Withering, Cry of Thunder, and Rend the Earth deserve consideration in any deck that is playing Eye. This is probably a bad idea, but at this point we've kind of committed to the format. Orks don't really present anything in the defensive or move stats that would recommend them above the Sigmarites. While they provide quite a bit of offensive power when properly outfitted for aggro, the Ork attacks are subpar when unaugmented. Most notably, none of the orcs have ranged attacks or Cleave, and only Bonekutta hits the 3 damage benchmark. 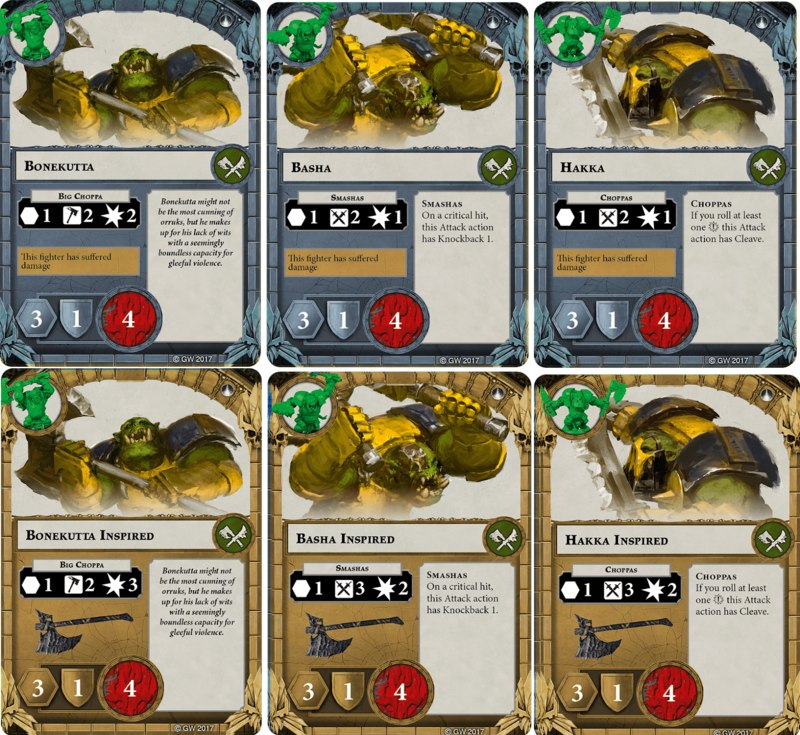 In terms of card access, most of the options were addressed in the Sigmar Leaders article, but there are a few upgrades worth mentioning for the Ork supports. Hakka and Basha can access 'Ard Head, which reduces all the damage they take by 1, to a minimum of 1. 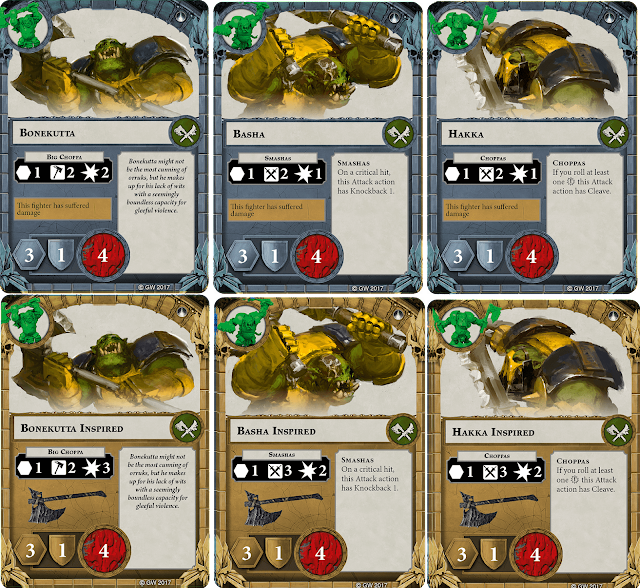 This particular mechanic is largely unused in Shadespire, so the Orks gain a unique bonus to survivability by using it. Bonekutta doesn't pick up anything of his own, but he can use Crush and Cleave, making his basic attack much more viable in an environment where you may only use it once or twice. Overall, the Orks are manifestly less good at defensive play than any of the Sigmar warbands. At least they're pretty. Once again, the Champions seem to be the dominant warband for defensive play. The versatility of the Farstriders support models and the brute strength of the Cursebreaker supports may be better suited for defensive hybrid play, but purely passive-defensive decks should probably stick with with the tried and true Champions. When considering a runner up, each of the other two armies are hampered by a truly glaring weakness: The Farstriders' inspire mechanic is awful, and the Cursebreakers' defense stat just doesn't stack up. Of course, when considering how often the two warbands will get to make use of their back-side defense lines, Cursebreakers may actually come out ahead, since Farstriders are unlikely to ever even gain access to their 2-block stat. This fact gives Cursebreakers a slight edge in the support models' strength. When considered with the strengths and weaknesses of the warband Leaders, Cursebreakers probably have a slight advantage that will increase as spell casting improves.